Erika Christakis, a Harvard College administrator who blogs at ErikaChristakis.com, posted a fascinating op-ed on Time.com — “Did Etan Patz Mark the End of Carefree Parenting?” She’s referring to Etan Patz, the six-year-old boy who disappeared in New York City in 1979, and was the first missing child to appear on milk cartons. She points out that of the 800,000 reported annual cases of missing or kidnapped children, most are found within hours. The stereotypical kidnapping of parental nightmares and blaring headlines (with a child held overnight by a stranger, involving ransom, harm or intent to keep the child) occurs approximately 115 times per year, with a nearly 60% survival rate (and just 4% unsolved). Christakis attributes the change to “advances in public health caused a shift in the way we understood harm”, but I think it’s how the media (yes, my profession) cover crime that has buffaloed us into believing that we live in dangerous places and dangerous times. Generally speaking, the media cover unusual violence thoroughly, but without the context of what’s really risky, and they’ve scared us into taking ridiculous and costly precautions and corralling our kids unnecessarily. The media cover violence that costs society the most economically and emotionally — family violence, including child trauma — the least, and with the least depth. 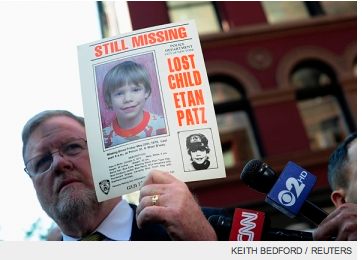 A good example of context-less fear-mongering is the Associated Press story about the effects of the Etan Patz kidnapping that appeared on USAToday.com and never once mentioned the media’s role. While officers are investigating all possibilities in her disappearance, experts say, abduction from the home is relatively rare, with just over 18 children taken each year. In the overwhelming number of cases, it’s a family issue. My profession needs to figure out a way to report on those cases in a responsible way that provides families and the kids the help they need. Our communities need to figure out a way to talk about these cases openly and to change our punitive approach to one of prevention, solution and assistance. ONE OF THE REPUBLICANS in the U.S. House of Representatives drafting a bill reauthorizing the 1994 Violence Against Women Act says her first marriage was to a violent alcoholic and abuser, and, later, as a deputy sheriff, she dealt with domestic violence cases, according to a story by Kathleen Hunter and Derek Wallbank in Bloomberg Businessweek. Sandy Adams of Florida is drafting the bill with Kristi Noem of South Dakota. They say it will be introduced this week and a House vote will be held as early as the week of May 14. It appears this is an “attempt to defuse Democrats’ efforts to portray congressional Republicans as hostile toward women”, according to the story. The piece provides a good synopsis and sticking points of the act — “divisions on immigration, gay rights and tribal court jurisdiction”. IN CASE YOU MISSED this interesting story — Studies Question the Pairing of Food Deserts and Obesity — by New York Times reporter Gina Kolata, it’s worth taking a look. Two studies — one published in Social Science and Medicine and the other in The American Journal of Preventive Medicine — looked at food availability in poor urban neighborhoods. The studies’ results were unexpected. Such neighborhoods not only have more fast food restaurants and convenience stores than more affluent ones, but more grocery stores, supermarkets and full-service restaurants, too. And there is no relationship between the type of food being sold in a neighborhood and obesity among its children and adolescents. There are many reasons for obesity, including availability of places to exercise, how friends and family eat, whether healthy nutrition is encouraged in school lunches. There’s also a link to child trauma, particularly physical and emotional abuse, according to the CDC’s Adverse Childhood Experiences Study (ACE Study), which hasn’t been addressed much.